For The Sake Of The Game continues to follow the simple formula of asking some of the world's greatest writers to be inspired by the stories of Arthur Conan Doyle and let their imaginations run wild. What results is an amazing array of stories from he following authors: Peter S. Beagle, Rhys Bowen, Reed Farrel Coleman, Jamie Freveletti, Alan Gordon, Gregg Hurwitz, Toni L.P. Keiner; William Kotzwinkle and Joe Servello, Harley Jane Kozak, D.P. Lyle, Weston Ochse, Zoe Sharp, Duane Swierczynski, and F. Paul Wilson. Some of the stories are pastiches, which feature Holmes and Watson, while others step away in time or place to describe characters and stories influenced by the Holmes world. There are also some whimsical tales of fancy, while others tell hard-core thrillers or puzzling mysteries. One beloved author wrote a song, and two others crafted a melancholy graphic tale of insectoid analysis. 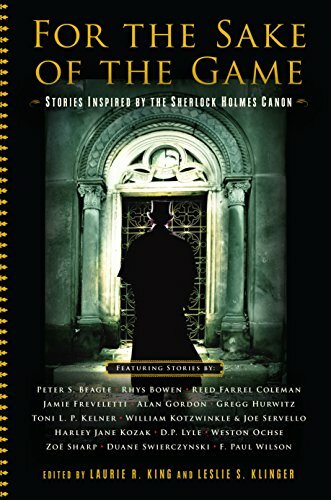 This collection, which was edited by two of the mystery genre's most esteemed experts, is a must for Sherlock Holmes devotees, as well as devoted readers, this holiday season.